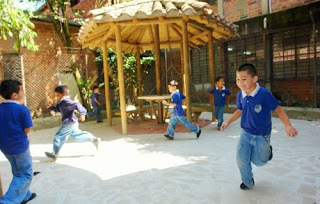 On July 18 Luz Marie, a School Teacher and active community volunteer in a town in Colombia sent the charity a picture of the updated playground that ACCESS Charity funded recently. The young students now have a safe and sheltered place to go in their neighborhood, and somewhere to be when it rains at recess. To learn more about this project, read the articles below on this page.